Liz Plaster, MEd, is a nationally known education and business professional. Her experience as a teacher, mentor teacher, and administrator in public and private schools, Head Start, universities, junior colleges, and social services has given her the opportunity to work with both children and adults of varied backgrounds. Liz holds a BS in human science and an MEd from the University of St. Thomas in Houston, Texas. Make learning exciting for children with over 160 hands-on, food-based science activities, each with a strong literacy connection. 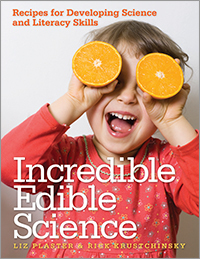 Incredible Edible Science provides everything needed to teach important science process skills in a safe, developmentally appropriate way. These cross-curricular activities promote brain development and fully engage children though physical involvementsuch as exploring balance and texture as they create popcorn ball structures, classifying and patterning different types of cereal, and investigating fractions with biscuitsand participation in literacy and language components such as phonemic awareness, vocabulary development, and following directions. After the activity is complete, children can eat their work!